Credit Tradelines » Everything you need to know in one page! They are the same as any trade lines of credit… seasoned tradelines, authorized user tradelines, etc. It’s just a term general enough to cover all of the categories. Typically, those searching for credit tradelines are looking for a way to add credit tradelines to their credit report in order to boost your score. That is what we do here at Superior Tradelines. Yes and we’ve written many times about whether or not tradelines work. You can read more here and here. The basic answer proof is in the Equal Credit Opportunity Act and the Federal Reserve Board Regulation B. 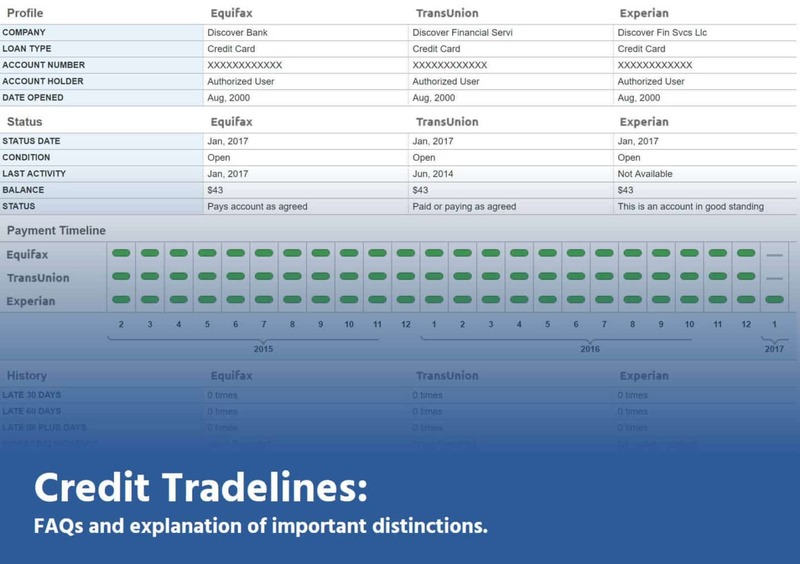 Credit tradelines are added to your report as authorized user accounts. This is a simple process and our job. How do you add credit tradelines to your credit report? They can be added to your credit report by having a primary tradeline account holder add you as an authorized user to the credit tradeline. Superior Tradelines, LLC has a large portfolio of credit tradelines and they stand by ready to add you as an authorized user for a fee. An answer any more specific than that would get into trade secrets. Rest assured, it is possible to add credit tradelines to your credit report. Is there a difference between credit tradelines and other tradelines? Not really. “Seasoned,” “authorized user,” and “piggybacking” are all the same thing as “credit” tradelines. These are just different terms. They are different in as much as “coke,” “cola,” and “pop” are different. At the end of the day, no matter what we call them, we’re talking about individuals being added as an authorized user to revolving lines of credit (for the purpose of increasing credit scores). This is colloquially referred to as tradelines for sale. Now, “primary” tradelines are – technically – different. “Business” tradelines are different, too. But, neither of those terms are what they sound like. We’ve discussed those topics on other pages. would like to be apart of this me program. I’m looking to elevate my credit tradeline. That’s what we do. By all means, reach out to us so we can discuss if tradelines are right for your credit situation and credit goal. Quick question, I have some old AU accounts that have been terminated since they expired. If I buy tradelines from you guys, would it be better if I got the old expired AU accounts removed first? Generally speaking, it doesn’t matter. But depending on the particulars of those accounts, I may change my answer. For example, were the accounts in good standing, did they show balances when they were terminated, etc. As with all clients, if you purchase tradelines from us we would first do a complimentary (free) credit report analysis and let you know what we think prior to transacting. But, like I said, the general answer is: it doesn’t really matter if you remove them or not (generally speaking, barring significant issuee with the accounts). My credit score is 615, I need to raise it to 680 to refinance with quicken and co-sign for my sons student loan. Adding tradeline will help? It’s possible. Reach out so we can do a credit report analysis, first, and we’ll let you know what we think. My credit score was Extrememly low because for many years I did not want to get myself in debt and purposely avoided all credit cards and loans altogether. Took me too long to realize the error in my ways (I’m 45). But I do now. In the last few months I’ve added two new credit cards (low credit line to start) to take my score from 500 to 576 which is a start. I keep my utilization low and pay off full balance immediately. I have a decent income of 100k. My questions, if you please, are as follows: Is there a minimum score that you would accept to add a tradeline? ; How long does it typically take to have an impact on your score; and lastly, how long do you “rent” the credit for? THANK YOU!! First, there is no minimum score related to whether or not we would add tradelines to your credit report. The analysis we use to determine whether not tradelines are appropriate is based on what’s in your credit report and whether or not we think tradelines will help. For example, you could have a 655 with a bunch of account (including some negatives) and, because of that, your score might only move 10 or 20 points. On the other hand, you could have a 576 because of limited information in your credit report and you will likely see huge increases in score. So, the question is not what your credit score currently is, but whether we think we can positively affect it with adding tradelines. 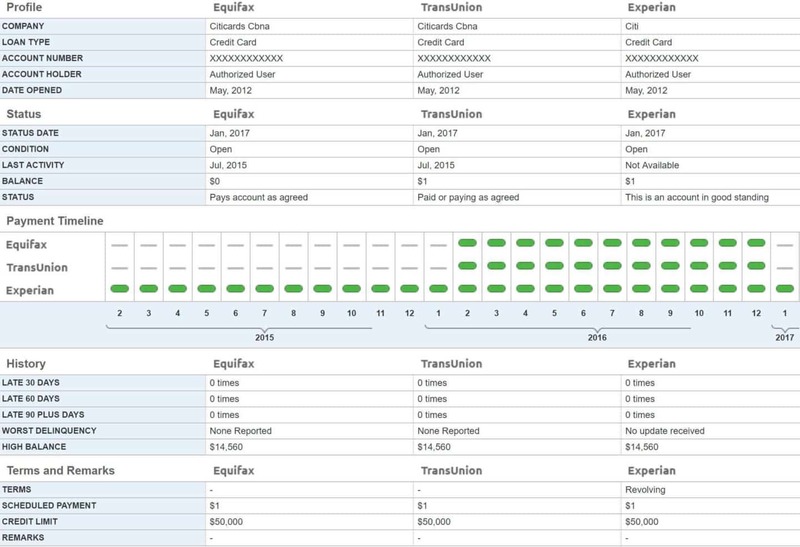 Second, the score impact is instant, as soon as the line is there, you have a new credit score. So, the question is how long does it take to add the tradeline. The answer is that it takes about 15 to 45 days (depending on the line selected, when it reports, etc.). Third, you rent the credit tradelines for about 30 to 60 days. The impact will be the highest at first and slowly diminish over time. You should check out https://superiortradelines.com/videos/ for more details on those questions.